The constellation Ophiuchus, the Serpent Bearer, graces evening skies in the northern summer. 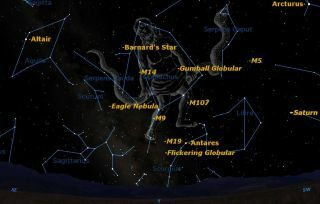 Now is a great time to see the constellation Ophiuchus, the Serpent Bearer, in the night sky. Ophiuchus is a sort of summer counterpart of the famous constellation Orion, the Hunter, which straddles the celestial equator and is prominent high in our southern sky on late December evenings. Ophiuchus also straddles the celestial equator, and it sits high in the evening skies in late June. Ophiuchus (pronounced oh-fee-YOO'-kuhs) is the celestial physician, for he represents the mythological doctor Aesculapius, who supposedly had the ability to bring the dead back to life. In fact, to this day, Aesculapius is mentioned in the Hippocratic Oath taken by physicians. Ophiuchus actually consists of two star patterns; the snake that the man is holding is a constellation in and of itself — Serpens. In some old star books and atlases, Ophiuchus is branded as "Serpentarius, the snake handler." For example, in Richard Hinckley Allen's classic reference book "Star Names: Their Lore and Meaning" (Dover Publications, 1963), the constellation is called "Ophiuchus vel Serpentarius." To further confuse matters, some people consider the serpent to be two separate constellations — the head (Caput) and the tail (Cauda). The official constellation boundaries set forth in 1930 by the International Astronomical Union keep the head and tail of Serpens as their own separate entities, and yet both body parts constitute one singular constellation. The serpent was important because it represented the ancient pharmaceutical elixir to cure all illness. Of course, in real life, that has proved to be a fallacy, and the term "snake oil" has come to mean an item that's sold as a remedy but has no real medicinal value. Yet, ironically, the universal medical symbol — the caduceus — depicts a serpent coiled around a rod. We see it, for example, on the U.S. Army Medical Corps branch plaque, and various health care providers have incorporated the caduceus into their logos over the years. If we had to pick the "flagship" constellation to represent a particular season of the year, there is no doubt that Orion would fill that category in the winter. For spring, it's probably Leo. The fact that Scorpius is so much brighter than Ophiuchus probably explains why Scorpius is recognized as a member of the zodiac and Ophiuchus isn't. And that's a shame, because the snake man really should be. The ecliptic — which marks the path in the sky for the sun, moon and planets — cuts a much broader expanse through the Serpent Bearer compared with the Scorpion. In late fall, the sun spends only about a week in Scorpius but three full weeks in Ophiuchus. Perhaps the real reason the Serpent Bearer is being denied membership in the zodiac is that its inclusion would boost the number of zodiacal signs to 13. There is an interesting tale that involves several constellations, with Ophiuchus as a key player. It goes like this: Orion was out hunting one day with his two faithful dogs (Canis Major and Canis Minor) when they started pursuing a hare (Lepus). But Orion ran into misfortune when he was stung in the heel by a scorpion (Scorpius) and died. After that, everybody concerned was awarded a place in the sky: Orion with his two dogs, Aesculapius with his serpent, the Scorpion, and even the hare that Orion had been hunting when he had his unfortunate encounter with Scorpius. The Serpent Bearer was placed directly above the Scorpion, and Orion was placed on the opposite side of the sky so that he and the Scorpion would never encounter each other again. Following Orion across the sky are his two dogs, while the hare lies below Orion's feet. Snake Man? Silo? Coffee urn? Depending on which star guide you consult, you're likely to see differing portrayals of Ophiuchus. Perhaps the best is the representation from H.A. Rey, who describes the Serpent Bearer as a "vast group, somewhat complex, resembling a voodoo doctor holding the pieces of a snake torn in two." To me, Ophiuchus resembles a tall silo with a pointed top. Probably the most intriguing tracing came from the late George Lovi, who was a good friend of mine. Lovi penned the popular "Ramblings" column in Sky & Telescope magazine for more than 20 years. He viewed the stars of Ophiuchus and Serpens as a pattern that resembles a coffee urn. He once said, "You can add a few extra stars to get a fairly good handle and spout." Not too far away to the southeast are the stars of Sagittarius and Corona Australis, which can be visualized as a teapot, teaspoon and lemon. Lovi called this entire region the "Celestial Cupboard." "For those who like to dilute their beverages, let's not forget that the Milky Way flows right through it," he once said. Editor's note: If you capture an amazing photo of a night-sky sight and want to share it with Space.com for a story or gallery, please send images and comments to managing editor Tariq Malik at spacephotos@space.com.